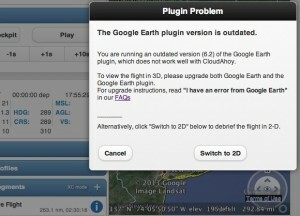 Many pilots have reported issued related to usage of the Google Earth plugin in specific configurations, which, in the worse case, prevents the debrief. The issues are resolved in CloudAhoy 3.0 by (a) improved hints on how to deal with the problems; and (b) a workaround if the problems persist. If you have receive a Plugin Problem message, you can troubleshoot the problem using our FAQs (and we’re always there to help). Or you can choose to switch to 2D, and address the Google Earth plugin problem at a later time. A new “3D” checkbox lets you switch between 3D and 2D debrief on Windows or Macintosh. Why switch to 2D? Primarily to avoid a frustrating situation in which the Google Earth plugin issue prevents you from doing the debrief. Some pilots have problem getting Google Earth to work in their browser; some pilots could not use CloudAhoy in the office because they are not allowed to install the Google Earth plugin. In 3.0, whatever issue you have with the plugin, you can always switch to 2D by unchecking the “3D” checkbox. 2D debrief is also faster, which can help if you have a slow internet connection.